Starting with the basic chassis, what size engine do you need–lower horsepower in the 300 range, mid-horsepower in the 400 to 450 range, or 500-plus? When you get into the high-end horsepower diesel engines, you will need a heavier transmission, driveline, and most likely front axle/suspension. Is it really needed? Other chassis decisions such as rear axle/suspension capacity will depend on the estimated weight of the complete apparatus. Another important consideration is the maximum overall length, height, width, and wheelbase of the complete apparatus. It is extremely important to be sure the rig fits in the fire station and under low bridges. Body components include not only the size and configuration of the compartmentation but what type of doors you want (roll-up or box pan) and how much equipment you intend to carry. National Fire Protection Association (NFPA) 1901, Standard for Automotive Fire Apparatus, has standard weight allowances for miscellaneous equipment for each type of apparatus, but some purchasers with larger apparatus and multiple duties specify higher capacities. In addition, numerous options such as shelves, tool boards, slide-out trays, roll-out/tilt-down trays, self-contained breathing apparatus cylinder compartments, and many custom modifications are available. What material is the body to be constructed of, and is there a preference for the type of body construction? Choices are aluminum, stainless steel, galvanneal steel, and polypropylene. Bodies can be modular, where the individual components are bolted together; formed, where the metal is bent into shape; and welded and unibody, where the material is fitted and welded into a framework. If you are carrying water or foam on the rig, what capacity and configuration of the tanks will fit your needs? If you require a low hosebed, will you carry less water or configure the tank as an “L” shape? Do you need to run plumbing or ground ladders through the tank? Is a tank dump or direct-fill connection needed? If you are specifying a foam tank, should it be integral with the water tank or a stand-alone type? What capacity is required? Is an optional power foam refill system going to be included? What type of tank fill gauges are needed, and are they to be located only on the pump panel or do you want auxiliary tank gauge lights on the apparatus? If the apparatus is equipped with a fire pump, what capacity is required? Is it to have one or two stages? How many discharges are needed? The standard calls for two 2½-inch discharges and the rest of the pump capacity can be made up with as many other discharges of various capacities as necessary. What type of discharge valves do you need–push-pull, crank, electric? Is the pump pressure going to be controlled by an electronic pressure governor or a manual relief valve? What type of primer is required, electric or air prime? Is a manual pump-shift override needed? Another important accessory that you might include is a pump overheat indicator. Warning and scene lights give the purchaser many options to choose from. NFPA 1901 divides the apparatus into four warning light zones with “Zone A” starting at the front and going clockwise around the vehicle. In addition, there are upper and lower warning light zones. There are requirements for each zone when the apparatus is responding and when it is on scene. Manufacturers satisfy these requirements with certified “packages” from the lighting manufacturers. Once the requierments of the standard are satisfied, any number of additional lights can be added. Typically, “Figure 8” lights, Roto-Rays, and traffic directing arrow lights are just some of the additions. With the introduction of LED scene lighting, many units that previously had a generator now illuminate the scene with 12-volt lighting. If you require cord reels for remote lighting or power for fans, a hydraulic generator appears to be the best choice, although some still specify diesel or gasoline generators. Many specifiers also require receptacles for rechargeable equipment that is powered from a shore line connection. Light towers are also popular, especially on rescue trucks. Aerial apparatus have their own set of unique specification decisions. Some of them are aerial ladder or platform, length and load capacity, rear-mount or mid-mount, single or tandem rear axle, and maximum outrigger spread. 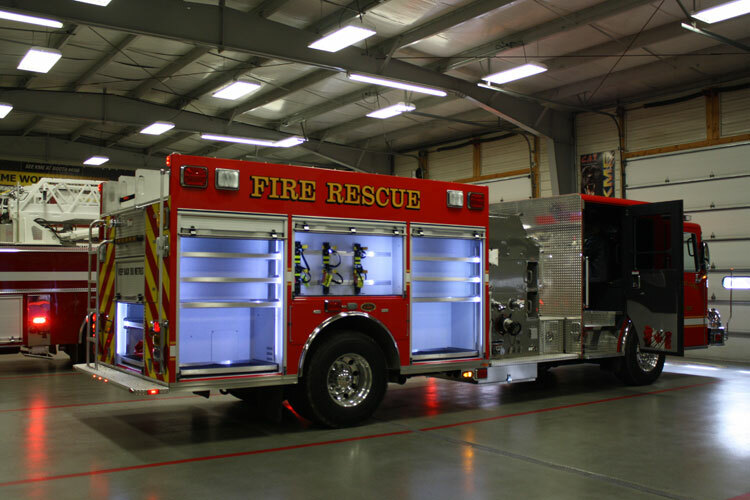 In addition, there are numerous options available, including equipment mounting at the tip or platform; various lighting configurations; and various water delivery systems such as single or dual monitors on platforms, types of nozzles, and pre-piped waterway or ladder pipes on aerials. We could go on and on, including options such as computer and radio equipment or mountings, GPS units, backup/side-view cameras, and so on. The important points are (1) to do your homework as to what is available, (2) be sure that the rig meets your mission requirements, and (3) that it fits within your budget! WILLIAM C. PETERS retired after 28 years with the Jersey City (NJ) Fire Department, having served the last 17 years as battalion chief/apparatus supervisor. He was a voting member of the NFPA 1901 apparatus committee for several years and is the author of the Fire Apparatus Purchasing Handbook (Fire Engineering) and numerous apparatus-related articles.